President Donald Trump is reportedly expected to recognize Jerusalem as Israel's capital Wednesday, upending decades of precedent. Both the Arab League and Palestinians are speaking out against the notion that the U.S. may recognize Jerusalem as Israel's capital. The groups warn the move could upend peace efforts and ignite violence. 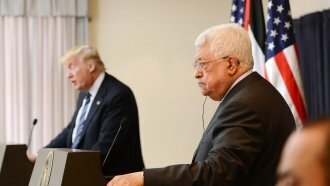 Palestinian leaders rebuked the news that President Donald Trump may move the American embassy from Tel Aviv to Jerusalem. Advisers to Palestinian Authority President Mahmoud Abbas said the act would destroy peace talks between them and Israel. The secretary general of the Arab League echoed the Palestinians. He said the move "will not serve peace or stability, but will fuel extremism and result to violence." Hamas, a Palestinian political party and militant group, said the move would lead to a renewed "intifada," or "uprising." There have been two such "intifada"; the latest started in 2000 and left some 4,000 Palestinians and Israelis dead. Reports indicate Trump is expected to announce he recognizes Jerusalem as the capital on Wednesday.